There are two major changes in Version 2! The first change is purely a mechanical one- no enclosure anymore - the choke is not as compact as it is in the original design (Ver 1). It is not a "one-box" device but rather an in-line jumper-like device. Before, the enclosure was keeping the coaxial from damage by garden critters and the brittle ferrite rings from mechanical damage. Now, with the open design, one should be more careful while handling/installing the choke. On the bright side - there is one less M/F Type-N connector pair (less insertion loss and one less connection to waterproof) - now the balun has one Male and one Female connector on each side, oppose to the two female bulk-head connectors mounted on the box. Because the antenna side pigtail (/w Male Type-N connector) is longer, there is no need for the short Male-to-Male jumper to the antenna. There are only two connections to waterproof. The open construction also allows for better cooling during Legal Limit power levels. The second change is electrical - since the space is not limited anymore, now the choke has more ferrite rings (24 pcs vs 18 in the old one) and less coaxial cable turns (2.5 turns in the new version vs 3.5 turns in the old) through the binocular core. This improves the upper frequency impedance (speaking of which, I have a couple more mix 43 single turn ferrite beads on the coax pigtails, for a total of 3)! More ferrite rings in the core - more inductance (to make up for the lower number of turns). Less turns on the other hand means a decreased capacitive coupling between the turns on higher frequencies. 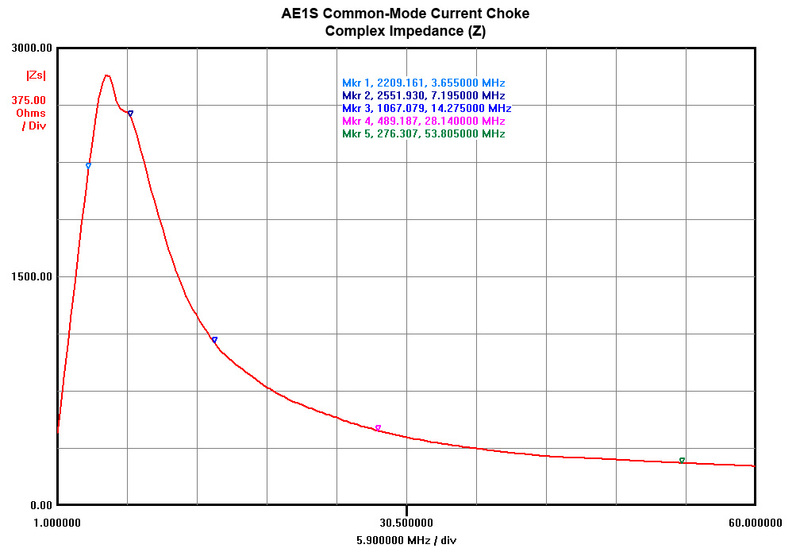 My MFJ-259B is limited in measuring the complex impedance (Z) up to 650 Ohms. 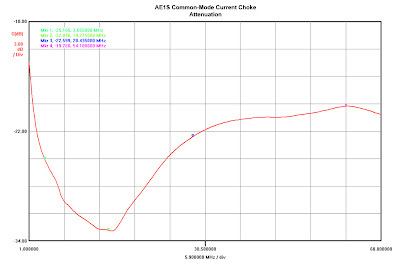 The choke was measuring >650 Ohms up to about 20 Mhz. The impedance is around 400-500 Ohms at 30 MHz, mainly due to the capacitive coupling between the turns. I have installed an additional plastic "jacket" over the coaxial in attempt to increase the space/dielectric between the turns and decrease the capacitive coupling but can't really tell if this has any real effect! I am using the same LMR-240 coaxial (RG-8X type with a solid center conductor). 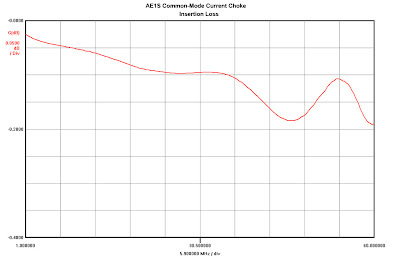 The choke should handle well power levels up to 1.5 kW but I am not planing to use it with more than 1 - 1.1 kW anyway (ACOM 1000 amplifier). For steady 1.5 kW use or with antennas, exhibiting very high SWR, I'll recommend the use of high-temp cable such as RG-142 (silver/teflon) for the balun. This cable has a solid teflon center insulator and there is no danger for the center conductor to migrate to the shield and short it, if substantial heating occurs - something that is possible with the polyethylene-foam based center insulator of the RG-8X / LMR-240. The ferrite toroids I used are made by FairRite (Part# 2643801002) - mix 43, OD 28.5mm, ID 18.5 mm, H 7.5mm. Price is about $6.10 for 10 pcs - Mouser Part #: 623-2643801002. 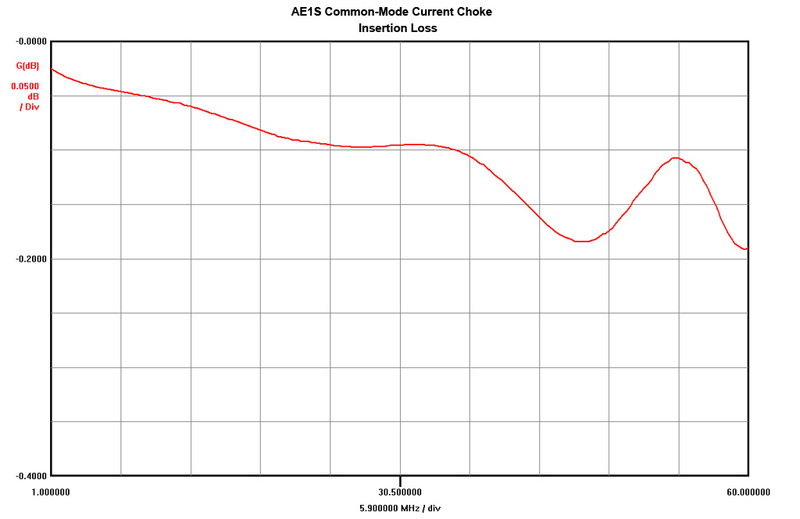 The new Common-Mode Current Choke takes a little more linear space but this is not a big deal. I am planing to put extra mechanical support (another plastic stake) for the choke itself. Insertion loss on HF <0.1 dB (due to connectors and coax cable insertion loss). 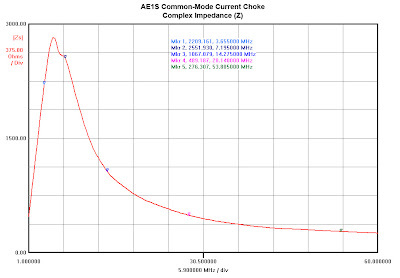 Complex impedance (Z) for Common-Mode current is 2200 - 2500 Ohms on the 80m -40m bands and drops down to ~300 Ohms on 6 meters (just as expected). On the 20m band chocking is still > 1kOhm. Overall, for a current balun of this size and cost, the result is excellent and it completely serves the purpose. I wanted to have it primarily for the lower bands - 80m and 40m but get some good values on 20m as well. If mix #31 is used for the ferrite, the optimization will be even better in the lower HF spectrum. 2-3 kOhm Chocking impedance is completely adequate for a tunable antenna like BigIR where the SWR never exceed 2:1 (given that the number of radials is sufficient and they are properly sized). I actually get SWR of 1.1:1 to 1.2:1 on 80 meters. 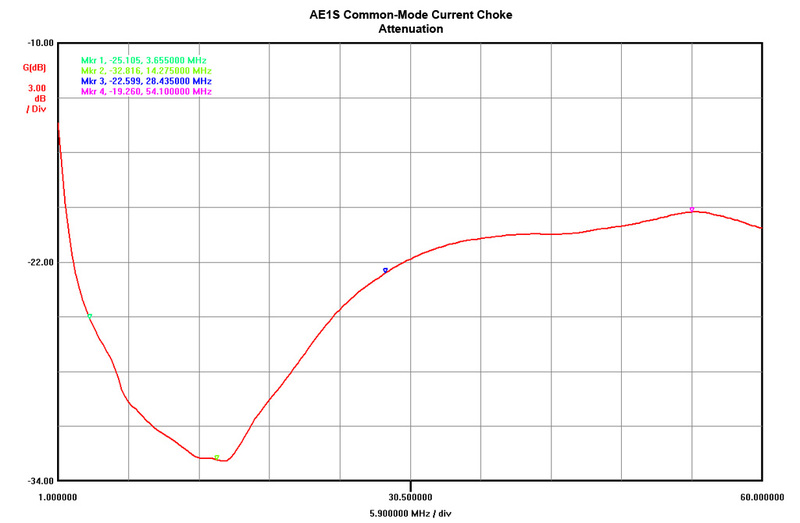 The VNA test just gives me a nice confirmation that I have achieved my design goal when building the choke. If more chocking impedance is needed, more of these in series can be built on the same piece of coax and folded to save linear space. A transmission scan shows attenuation >30 dB on the lower bands but this is a less relevant test to a real-world application as the measurement of attenuation is done in a true 50 ohm system. In reality, the antenna feedpoint (Z) is never exactly 50 ohms.